← Mountain Aid safety talks next week all free entry and I am sure it will be a good night. 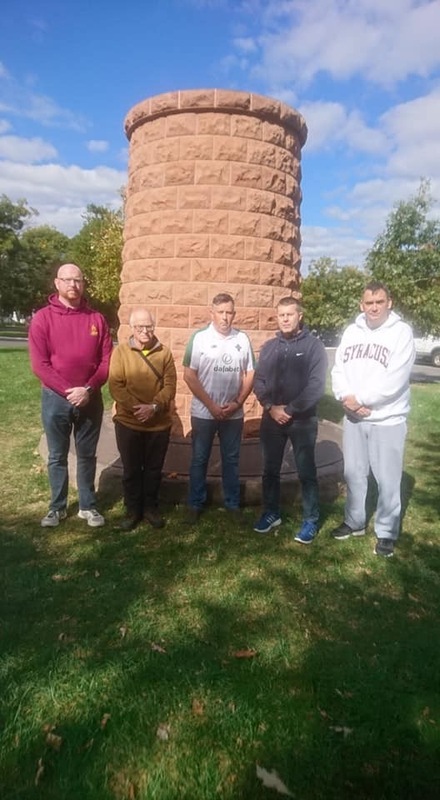 Ten 10 days ago I was at Arlington Cemetery in the USA and that is where we started our journey to Cycle to Syracuse in memory of the Lockerbie victims involved in the tragic events in 1988. The Cemetery is where the Lockerbie memorial is a powerful symbol of simple Scottish stone and a powerful reminder of those who died. I wish I had time to visit more of this hallowed place. During my career I attended many aircraft crashes as a member of the RAF Mountain Rescue Team. This call -out in 1982 is one that helped mould me. As a young leader I was tested to the full that night alone on a wild mountain away from any assistance. There were no mobile phone, digital mapping and we were on our own for 14 hours in the wildest weather. After finding the remains of the crew staying alive became the main thing and it was some night. This is part of the story so please do not forget that the military die in training. This was the height of the Cold War and was a huge influence on my life. “At about 8 pm on the night of 7 December 1982 after descending to about 1000ft over Loch Scavaig, an F-111F aircraft struck the southern face of the 1620 foot peak Sgurr na Stri, The unarmed aircraft, serial number 70-2377, was on a regular training mission from RAF Lakenheath in Suffolk. 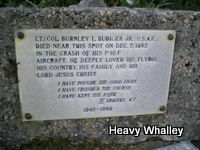 The pilot in the left hand seat of the aircraft was Major (Lt Col. Selectee) Burnley L. (“Bob”) Rudiger Jr., aged 37, from Norfolk, Virginia. Major Rudiger was survived by a wife and two children who were then resident at Risby, Suffolk. The weapons system operator in the right seat was 1st Lt. Steven J. Pitt, 28, from East Aurora, New York. Lt. Pitt was survived by a wife and two children, then resident at Icklingham, Suffolk. In was December the 7 th 1982 I was stationed at RAF Kinloss in the Morayshire Coast in Scotland. The Falklands war had just finished but RAF Kinloss where I worked was still working 12 hour shifts. I had done the early shift from 0600 -1800 in In Flight rationing the Nimrod planes; it had been a busy day. I went back to the Mountain Rescue Section where I was a part-time member and was sorting my equipment of for a weekend’s winter training with the Mountain Rescue team. As I finished the phone rang it was the Rescue Centre at RAF Pitreavie saying that an American F111 Fighter aircraft from RAF Lakenheath with two crew had crashed in the Isle of Skye. They thought thatit was on the main ridge and another aircraft in the two man formation was flying over the area. Skye in Scotland is a mountaineer’s and climber’s paradise, in winter it becomes Alpine with ascents of the easiest peaks not for the inexperienced. The time was just after 2000 hours it was a wild winter night, pitch dark and with snow at sea level. I was told to get a fast hill party together in 15 minutes and get to the aircraft pan as a Sea King helicopter from RAF Lossiemouth was on its way to take us to Skye. There were 6 of us I was the party leader Allan Tait. Joe Mitchell, Keith Powell (RIP) Chris Langley, Paul Whittaker and my dog Teallach were the fast party. There was little time to get kit sorted and I took as much climbing gear and rope as we could carry. The Skye ridge in a December night was not the place to be but this was payback time for us this is what we trained for. The forecast as I said was awful and there was a good chance of the aircraft not getting us to the crash position due to the weather. It would be a long hard night ahead. The position we were given at first was right on the main ridge between Sgurr Greta and Sgurr a’ Mhadaidh a nightmare scenario in winter and at night. This was 1982 before modern phones and communications and the kit we had was still basic, our bivouacs kit was still a big orange polythene bag, which was next to useless in wet weather. We carried hill radios that were efficient, line of sight but heavy and suffered in the cold and wet. The helicopter was at Lossiemouth a few minutes away flying with 15 minutes and in the darkened aircraft. I was told to go to the front for a brief and stayed there most of the trip out to Skye. The snow was falling very heavily and the crew would have to use all their cunning and experience to get to the incident. This was also in the days before night vision equipment and the modern GPS, It is hard to believe we flew low near the roads to get updates on our navigation. I do not enjoy flying at the best of times and this was a worrying trip. My 5 team companions were in the back oblivious to what was happening. When a military aircraft goes in all the efforts are made by all concerned and the rest of the team would follow by road a journey as bad for them in roads plastered with snow and ice and taking up to 6 hours! We would be on our own for at least 12 hours. My head was on fire with plans but we had to get there first and I was helping picking out snowy land marks on the way. At Achnasheen about half way there after about 35 minutes we had to land down on the road as the weather was awful. We were soon off again and all the time getting updated on the situation and a new fix for the crash site. It was now near Loch Coruisk a remote part of the ridge with no road access. There was another aircraft an F111 over the site that was now pitch dark covered by snow and cloud. The local Skye Mountain Rescue team were trying to get to Egol and help us with their local knowledge; this would be invaluable in these hills. As we neared Egol (This is a village on the shores of Loch Scavaig towards the end of the Strathaird peninsula in the Isle of Skye.) I moved to help the winchman by going on the harness near the aircraft door. The weather was still wild and snow was blowing everywhere as we were dropping down to pick up the Skye Mountain Rescue party. The winch man saw Hydro electric wires nearby and we had to rise steeply to miss them, we were very lucky. The aircraft pulled away and I was told we had one chance of a drop off as the aircraft had a problem now due to the power used. We flew out to sea and I had a quick look at the map, winching was not possible so picked a spot at sea level I knew well Camasunary Mountain Bothy near a hill called Sgurr na Stri. This was near where the aircraft last known position was it the place to start our search. We could not wait to get out of the helicopter and my party inside had a good idea how near we had been to a disaster. They were at the bothy and they also had night to remember, they had just had a wet day on the nearby Munro Blaven. Paul Rosher, John Foggin and Paul Robson had the fire on in the bothy and the dinner was getting cooked. In Paul’s own words “Everything happened so fast, a bright red light lit up the whole bay, we could see right across it. Everything started shaking, door windows and table objects on the table. Then there was a shockwave, not a sound but a physical pressure that moved from right to left and when it did the fire went out, the air was briefly sucked out of the room. Kit was flying through the air and part of the ceiling fell on Paul, who ran into the white light covered in plaster. I remember thinking that a nuclear war had started after all it was very much still the cold war years and the Holy Loch did harbour nuclear submarines. 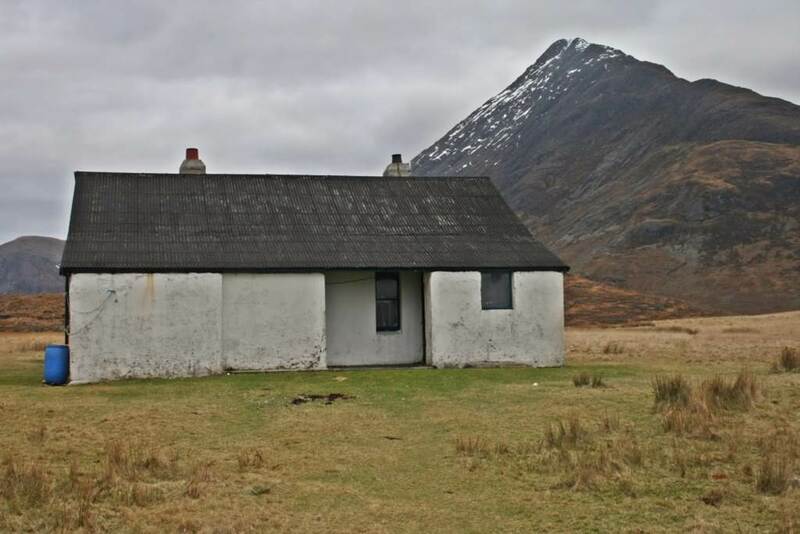 I am sure Paul (who was one of the boys in the bothy when the aircraft crashed) he does not remember but I am positive that the three of them came out of the Camasunary Bothy with their hands up in the air and covered in white dust from the roof. They had an epic time after the F111 aircraft hit the mountain behind the hut. Sgurr na Stri though only a small hill, was on fire, the explosion, the shock wave and the blast had nearly destroyed the bothy and they like us were fairly shocked. I asked Paul if he knew whereabouts of the crash was as by now the aircraft that was circling the crash site had gone. It was snowing heavy the cloud was down and it was as dark as hell. 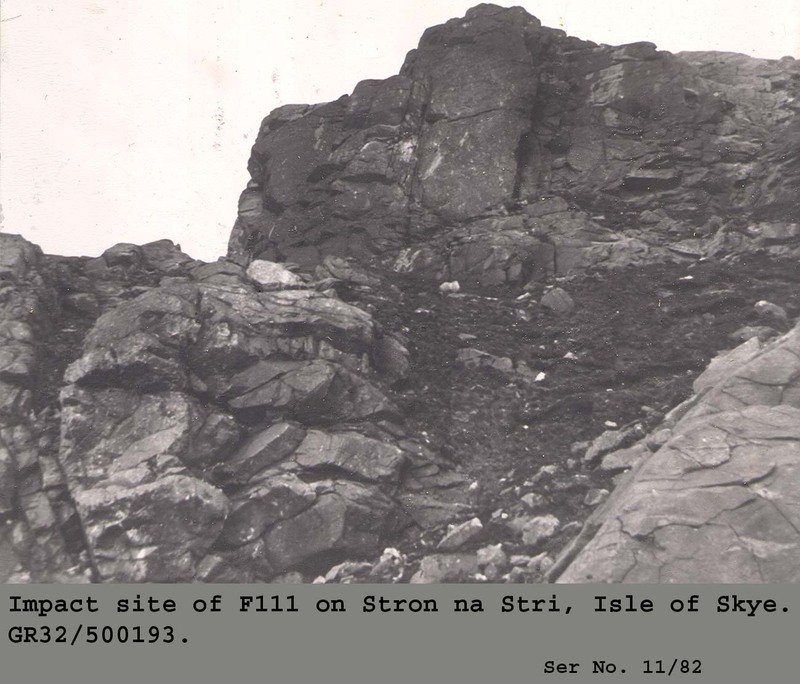 The hill is defended by a big river and a very steep South Face, typical Skye, with gullies and steep cliffs. Worse now as even the shoreline was covered in wet snow. Paul said he knew the hill well, I had never climbed it but it was only small by Skye standards, or so we thought! We had some additional lighting with us, state of the art Sharks eyes which though heavy and needed 6 bicycle type batteries helped illuminates the ground. We took Paul with us and asked the others in the bothy to wait until more troops arrived. The first obstacle was the river but there was a rickety bridge which we crossed with trepidation, but we were high on adrenaline and were soon across, my dog swimming the fast flowing river. It was bitter cold and the smell of aviation fuel and burning was unmistakable. I am asked what do you do at times like this, it all seems to work well and we tried to split up to search a bigger area but the group was too hard to control in the dark. The ground was wild like a Glencoe corrie steep and slippy in the wet snow, route finding was tricky as small buttress’s appeared in the dark. A slip would have been serious but my dog Teallach has a great hill sense and always picked the best line. We very quickly came across small pieces of wreckage- sharp pieces of aircraft metal lying in the ground the light from our torches and lights glinting in the gloom. You have to be aware of the dangers even after a crash, fire, sharp metal and explosives even if the aircraft was unarmed as this one was. You also have so many chemicals goodness knows what you are breathing and nowadays you would enter a crash site in full protective gear, this was 1982. It was time for Paul to go down as we were nearing the impact point and I feared what we may find. There was also still a good chance that we may find the escape capsule and the crew and that may be on more dangerous ground, we would need all our small team to assist. It was better we carried on alone and Paul was taken down though he wanted to stay but we had no choice Allan Tait (Gus) escorted him down. It is also very wise not to put people in such close to proximity to what we were about to find. By now we were finding large bits of aircraft but no sign of the capsule, it was passed midnight we stopped for a break, it was now very wet snow falling, and we were soaked and needed to gather our thoughts. Everyone was cold and tired I had a fine bunch of troops and we agreed to search and spread out, it was not long before we found pieces of the cockpit and sadly the crew. It was fairly easy to decide that no one had survived the crash. In moments like this life stands still. We were working in hope that we would find two people, I was sure they would have ejected, it hit me hard, though you cannot show it at the time. Two unknown men to us American Aircrew with families, children and lives just like us had died where we now stood. It is impossible to explain our feelings at the time. Due to the sensitivity of this crash and where we were it was now about 0300 and we decided to bivouac at the scene until the reinforcements from RAF Kinloss arrived. We had no radio Communications all night and I tried every hour to get through transmitting what we had found, there was no answer, even Gus at the bothy could not hear us, we were alone. It was a hellish night, and looking back after 40 years in Mountain Rescue it was one of my worst nights ever on the mountain’s. In the end we rested and bedded down we were soaked and wet all night with the fresh snow and rain making the ground slushy and wet. I could see the two young ones suffering so by 0500 we were all up waiting for daybreak; it was a very cold night. By 0800 the weather had cleared and we heard the team on the radio, they had an epic drive 6 hours and stayed the night at Jethro Tull Ian Andersons Farm(the musicians farm) and set out at first light. They managed to drive in to near Camusunary a crazy road and eventually reached us by midday. We showed them around the crash site which was all over the area where we had bivouacked. We could not get back down quick enough and were soon back at Base Camp in Skye by mid-afternoon. We had been on the go that day for over 24 hours. Gus had a good night in the bothy and the Paul and the boys were amazed when Gus produced a bag of hidden food from a wall near the bothy. He had hid it a few weeks earlier for a walk across Scotland in the summer; they ate like kings unlike us. We were exhausted but still high on adrenalin and after some food sleep took over. Over the next few days the RAF Kinloss Mountain Rescue and the USAF recovered the two casualties a grim task after some USAF Investigating officers allowed them to be taken from the crash site. I then spent a week working with the Investigation Team on the mountain walking in every day for a week with them looking after them on this amazing little hill. We started in the dark and walked out in the dark it is short days in December, it was a difficult time for all. I learned so much from this incident and met some incredible people. I learned so much about communications, leadership and fought for decent kit for the team. After this so many lessons were learned that stood me in great stead for other big call outs like Lockerbie. Paul who I met on the hill that night is now a great friend, living in Skye and a member of the Skye Mountain Rescue Team. The others in the team remain friends for life and Keith who was a power that night on the hill is no longer with us. “In the storm lashed car we hide from the weather, we have to leave it warmth. Taking a route over swollen streams and sticky bog. Blavens Southern ridge climbs, long, fingered snow-covered winds its way to the heights. Cresting the beleach. we see the meadow, the beach and there “Falkland like” the bothy Camusunary! The families of the crew have been in touch over the years and sent some wonderful words thanking us for our efforts and happy we made a trip in 2012 on the 30 th anniversary in memory of their loved ones. For Gus, Paul and myself it was some trip. I was back again in May 2017 staying in the bothy at Loch Coruisk with my local Mountaineering Club and visited the crash site for 2 days. There is still so much wreckage about and some even 2 kilometres from the impact site. It is a wonderful poignant place but is full of memories for me and those families involved that we could do little for. I still hear from some relatives every year, through my blog which is heart-warming and few knew of our story. In 1982 I was 30 and in my prime as a mountaineer but that night tasked us all to the full, looking back what a sad event and one I will never forget. There is a small plaque at Elgol with a view to Sgur Na Stri with a view to the incredible mountain and lots of haunting memories. In memory of the crew and all those who pay the ultimate price. Lockerbie Memorial Cairn at Arlington Cemetery. This entry was posted in Aircraft incidents, Articles, Bothies, Mountain rescue, Mountaineering, Views Political?. Bookmark the permalink. Out wandering the other day and my mind drifted back to this posting. How the RAF, although voluntary MRT, gelled together across all trades, whether that be to get some vehicle spares, extra rations, or better clothing. There was also a great respect between the aircrews of our helicopters and the ground troops. Now if this accident was to happen today, just how would we cope with such a splintered, split up organisation more intent on counting pennies than attempting to help others. Heavy states that he hardly had time to pack a good kit bag before having to be on the pan to meet the SAR helicopter. Todays team would have all the time available as plans were discussed between different agencies, maybe a helicopter would be dispatched to pick up the team, or more realistically the team would need to get to the Inverness base of the private SAR helicopter. I’m positive that the private SAR would not have attempted to drop off the team in those weather conditions. The possibilities are endless. The only thing I can say, is that today’s rescue would be less effective, slower at response, and definitely not the same backup available. Had that crew survived injured, every second counts, and decisions should be seamless.